It may have started out as a game and a joke but the Jon Stewart and Stephen Colbert rally in Washington D.C. may be the most important political event this year. The political stage has been completely dominated this election season by Glenn Beck and other right wing commentators and the various Tea party rallies. 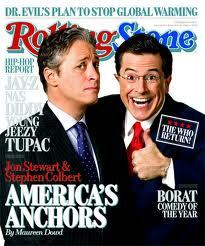 Can Stewart and Colbert prove there is a a major alternative American voice out there as the mid term elections approach and the Tea Party is running rampant? The October 30th "Rally to Restore Sanity" ,coming just a short time before those elections could prove to be a rallying cry and a Woodstock for the millions of liberals and moderates whose voices, with the exception of Stewart and Colbert, have not been heard. Stewart in particular has shown an ability to articulate the sheer puzzlement and occasional despair at the charges being flung from the right against the Obama administration and others. He skewers the worst excesses nightly as does Colbert in a more complex fashion. But who do they speak for, and will the people they speak for turn up on the mall and give voice to the reality that while both are comedians, what they are addressing is deadly serious? Time will tell but it will be a fascinating exercise in power politics, behind all the grins and one liners.